(R)-HPA reached 63.30%, which indicated an increase of 14.9%, as compared to the yield obtained before optimization. cally pure (S)-or (R)-α-Hydroxyphenylacetic acid [5-9]. catalysts, limited efficiency and low yields. mization of the fermentation medium. Technology of Fujian Province (No. 2009N0046). local suppliers and of reagent grade. maltose 10, NaCl2, pH 7.2.
with 2% (w/v) of agar. tylammonium bromide (pH 6.8) at the rate of 1.0 ml/min. 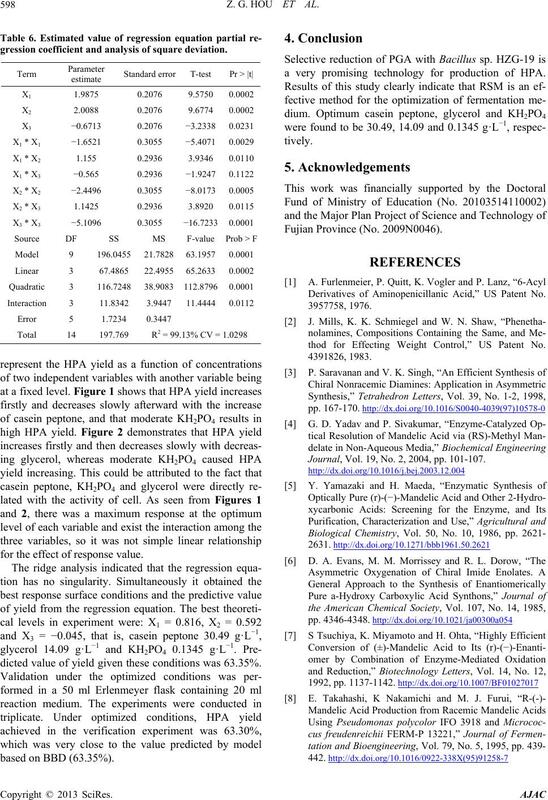 of HPA is considered as response value. Eapeafo ilichmoch exerimnt ws perrmedn tripates, te sae belw. 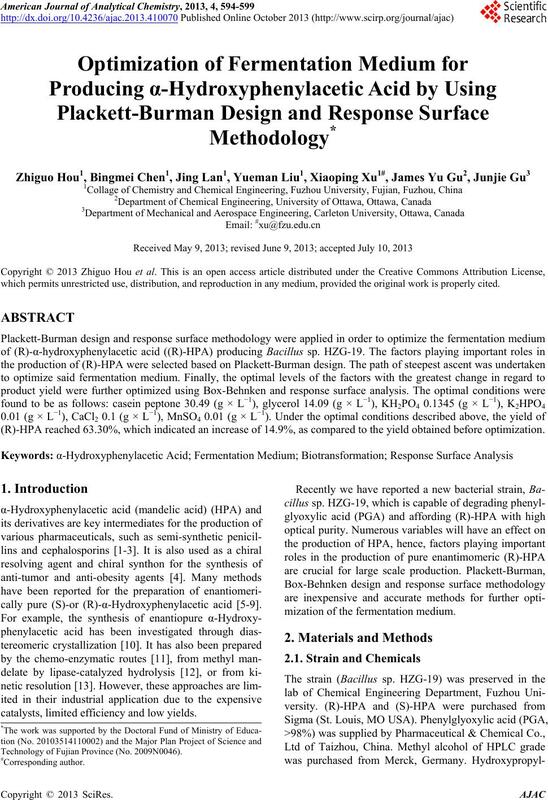 Z. G. HOU ET AL. not exceed 5, Box-Behnken method is more economic. 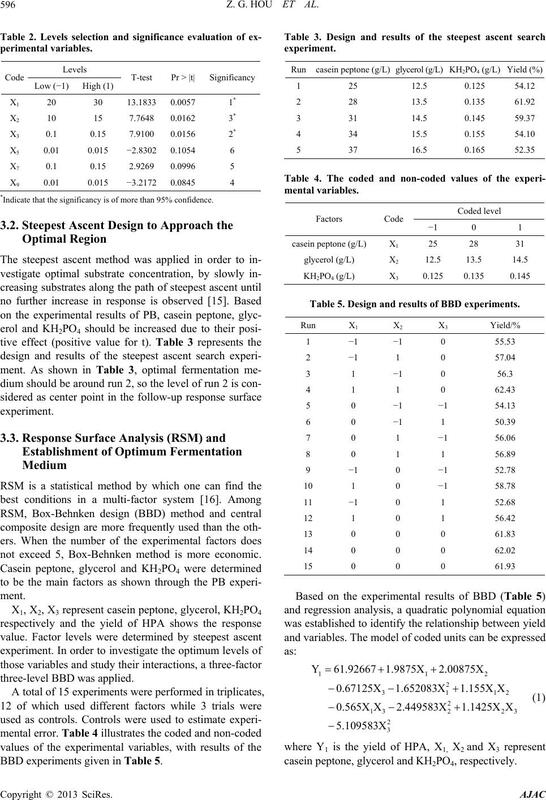 BBD experiments given in Table 5. Table 5. Design and results of BBD experiments. casein peptone, glycerol and KH2PO4, respectively. variations. A low value of coefficient of the variation (C.
value of 63.1957 implies that the model was significant. represent casein peptone and KH2PO4, respectively). sent glycerol and KH2PO4, respectively). 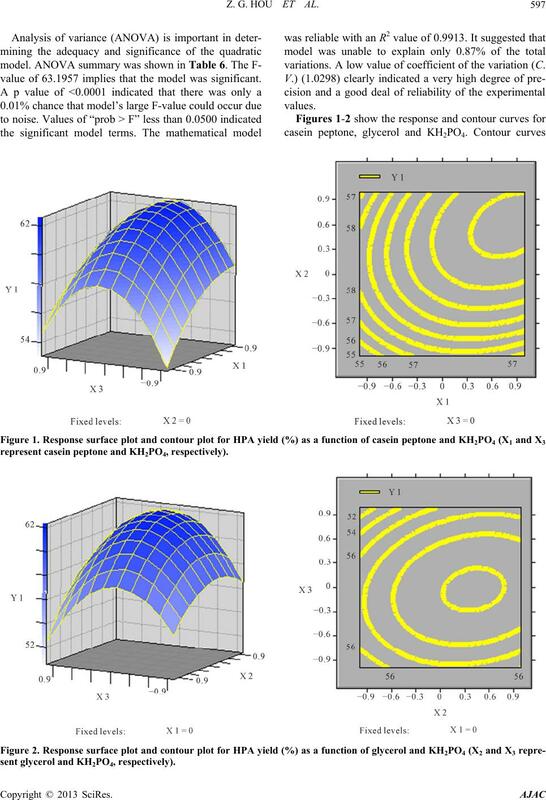 ression coefficient and analysis of squareg deviation. Total 14 769 R = 99.
logy for production of HPA. Derivatives of Aminopenicillanic Acid,” US Patent No. for the effect of response value. dicted value of yield given these conditions was 63.35%.
. Schmiegel and W. N.
thod for Effecting Weight Control,” US Patent No. Journal, Vol. 19, No. 2, 2004, pp. 101-107. 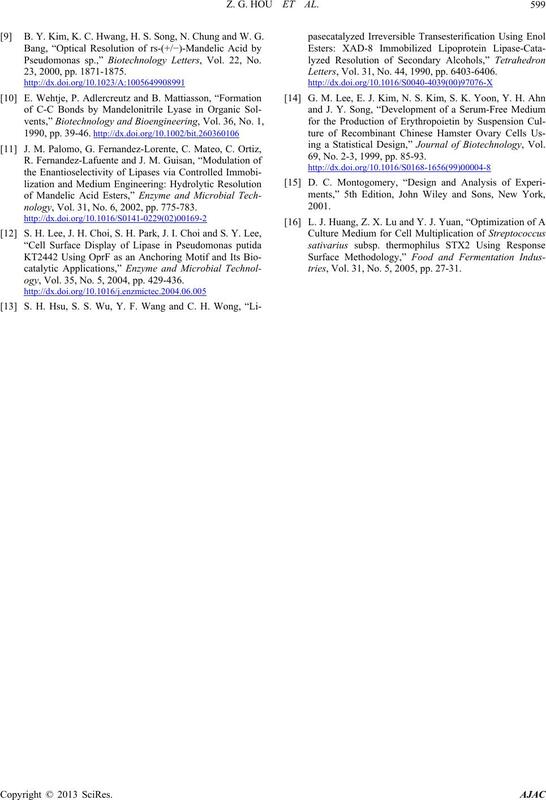 B. Y. Kim, K. C. Hwang, H. S. Song, N. Chung and W. G.
Pseudomonas sp.,” Biotechnology Letters, Vol. 22, No. nology, Vol. 31, No. 6, 2002, pp. 775-783.
ogy, Vol. 35, No. 5, 2004, pp. 429-436.
Letters, Vol. 31, No. 44, 1990, pp. 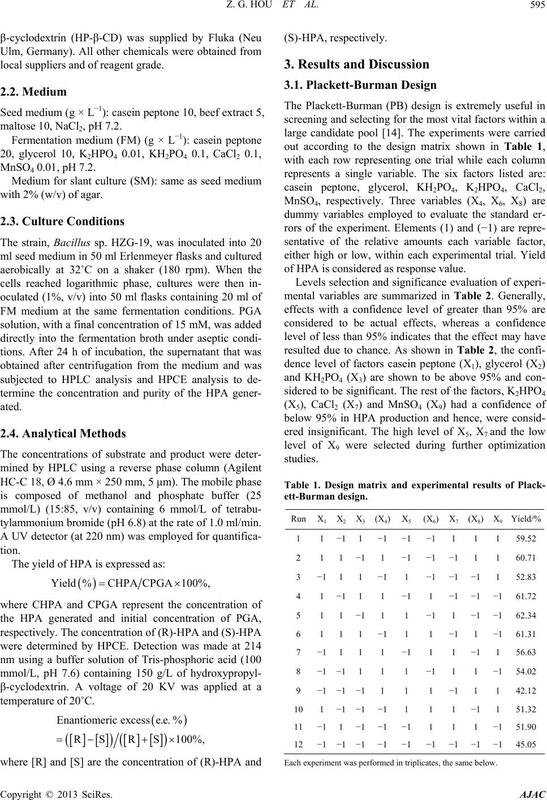 6403-6406.
ing a Statistical Design,” Journal of Biotechnology, Vol. 69, No. 2-3, 1999, pp. 85-93.
tries, Vol. 31, No. 5, 2005, pp. 27-31.